Technically brilliant, Sergey Kovalev defeated Jean Pascal by eighth round technical knockout from the Bell Centre in Montreal, Quebec, Canada. Sergey Kovalev (27-0-1, 24 KO) is good for boxing. Indeed, he is one of the few boxers who is the perfect marriage between crafty wizardry and suspenseful titillation; that is, both a ring general and a perpetual stalker. Kovalev entered the ring with only a one-inch height advantage over Pascal, yet he made Pascal appear miniature. With only a half-inch reach advantage, Pascal literally had to leap to reach Kovalev. Seemingly nonathletic, Kovalev had superior balance and quickness of feet. The opposite of the tight mesomorph in Pascal who consumes energy, Kovalev's loose lanky body is always relaxed never fully exerting itself. Whereas Pascal generates power from strenuous muscular exertion, Kovalev's comes from technique. As Pascal wastes his athletic advantages through poor kinesthetic awareness and mechanical inefficiency, Kovalev realizes his potential through fluid economy of motion and position. Kovalev began the first round by establishing his jab and straight right hand. Pascal was inactive, relying on squatting low to avoid Kovalev's right. Pascal, already desperate and impatient, lunged in recklessly to surmount distance in round two. Kovalev could have countered, but Pascal was quick, two rounds was not enough to time Pascal, so Kovalev instead shuffle stepped away to keep his distance. Pascal was clipped by a right hand that got his attention. By round three, Pascal experimented with another gamble, rolling Kovalev's right in order to counter with his own right hand. Pascal would continue with this tactic for the rest of the fight, with mixed success. With seconds to go in the third round, a Kovalev right hand knocked Pascal's upper body through the ropes. This was ruled a knockdown since the ropes prevented Pascal from falling. Pascal wobbled back to his corner at the end of the round. Having not fully recovered, Pascal began round four by laying on the ropes while Kovalev tried to finish him off. As most of Kovalev's load was blocked by Pascal's gloves, Pascal was able to recover. For three consecutive rounds, Pascal got the better of Kovalev with a counter and lead right hand. Kovalev regained control of the fight in round seven by being less aggressive and using his jab to control distance. Pascal was less accurate with his overhand right. The round ended with Kovalev landing a left hook. 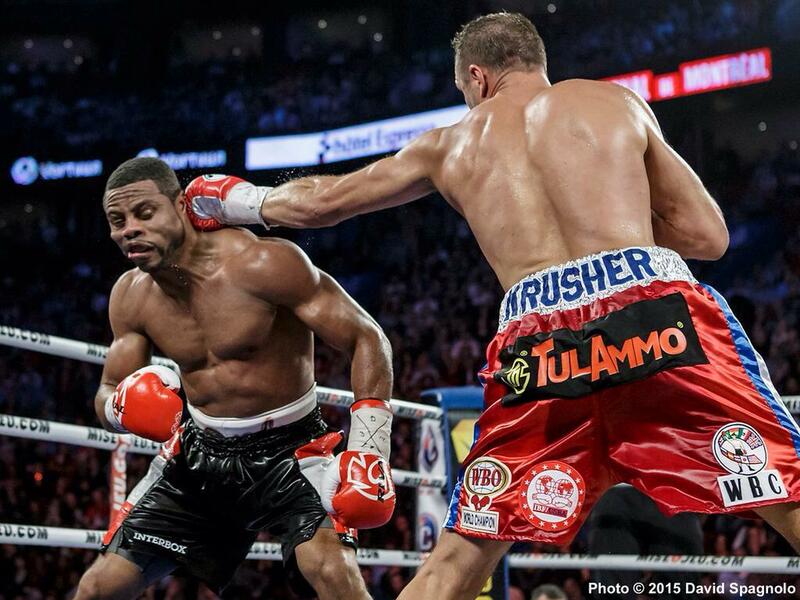 More comfortable, Kovalev once again became the aggressor in the final round. Immediately prior to a second slip, Kovalev managed to send Pascal to the ropes with a left hook. 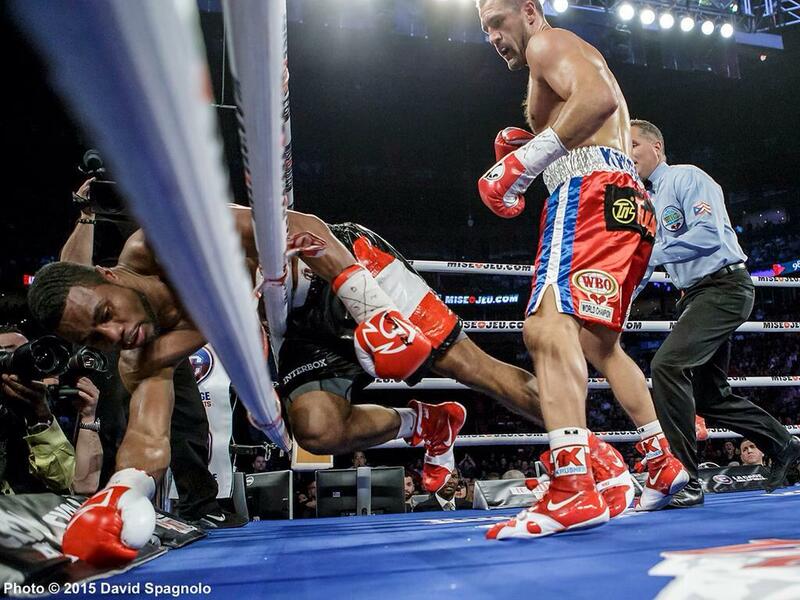 As the referee walked Kovalev back to a neutral corner, Pascal stumbled backward, almost falling back into the ropes. Thinking that he had also slipped, when in reality he was hurt, Pascal attempted to walk to an adjacent corner only to find himself staggering into the ropes on the other side of the ring. Kovalev had noticed this and realized that Pascal was hurt. Kovalev then charged towards Pascal landing a right hook around Pascal's guard as Pascal lay against the ropes. Inviting Kovalev to throw another right hand, resorting to the counter right with which he had previously found success, Pascal took another right hand to the temple, at which point the referee stopped the fight. Kovalev was ahead 68-64 in all scorecards at the time of the stoppage. If one were to chide Jean Pascal (29-4-1, 17 KO), it should not be for his poor strategy but rather his poor endurance. His over-reliance on countering Kovalev with right hands – and his leaping off-balanced attacks, as well as low punch output – had more to do with him not wanting to expend energy using his footwork to cover distance. Sergey Kovalev beats Jean Pascal to retain his light-heavyweight titles.